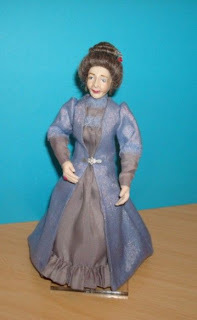 This is the first lady doll I've dressed and wigged. The poor lady has been through the wringer at the hands of this Klutsy Katie. We survived (barely). I learned a lot and hopefully WILL get better. Cheryl in NM made the doll. The dress pattern is by Kathi Mendenhall. She looks beautiful, you have certainly done a great job and considering it is your first, fabulous! She is beautiful Karolyn, very well done!